Photo Courtesy of Ron Adams. During hazy summer days in Somerdale this year, 12-year-old Victoria Adams was selling hand-crafted flower pens and Philly soft pretzels outside of Wal-Mart. Raising about $400 over the course of two days, the 12-year-old student at Voorhees Middle School used the funds to purchase nearly 100 supply-stuffed backpacks for children of U.S. Wiggins Elementary School in Camden. Inspired by her mother, a teacher at Elizabeth Haddon Elementary in Haddonfield, Victoria decided to dedicate her bat mitzvah project toward education, particularly serving underprivileged children. 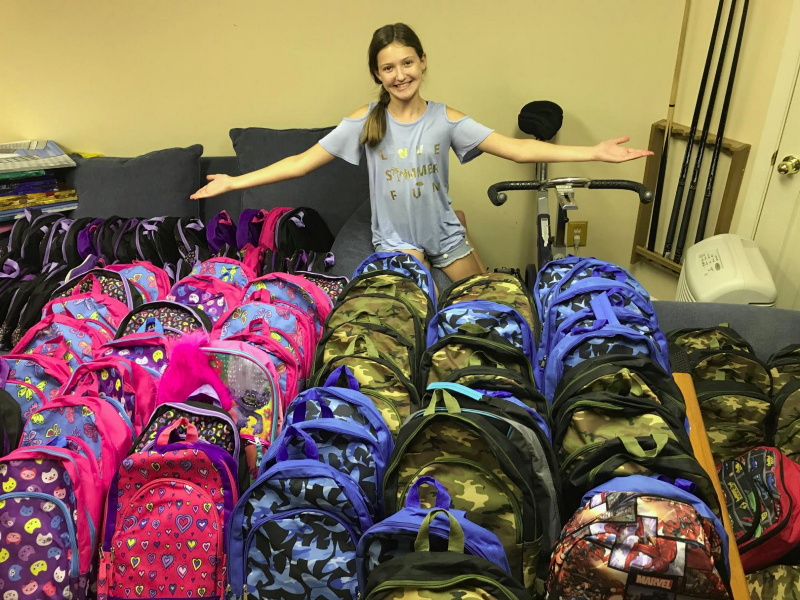 With online and business donations, the seventh-grader superseded her original goals, allowing her to fill each of the dozens of bags with two folders, paper, notebooks, rulers, colored pencils, crayons, markers and a pencil case. In the weeks leading up to the start of the school year, Victoria, with the assistance of her mom and sister, formed an assembly line in their basement, diligently enriching each bag with educational requirements. With leftover funds, Victoria further benefited Wiggins, as she purchased supplies for the nurse’s office, including 50 pairs of underwear and socks. About a week before school started, Victoria and her parents transported the items to Wiggins. While hauling the hundreds of items inside, a family of young girls witnessed the Adams lugging the supplies inside. Without hesitation, Victoria handed the children spare backpacks. “She gave them big hugs, and they walked away feeling so excited for school,” Debbie said. Although the school year has started, Victoria’s services are not confined to the supplies, as she’s still raising money online for uniform shirts, which will be given to Wiggins. While her bat mitzvah is set for January, Victoria has no desire to put her helping hand to rest after the ceremony.